What’s New With Exchange 2013? After a subscriptions upgrade to Hosted Exchange 2013, mailbox storage will increase from 25GB to 50GB. There is no price increase associated with this change. The increase is simply part of our promise to continuously deliver value to our customers. The biggest change as a result of the upgrade is the redesigned Outlook Web App. Please ensure you have checked email client compatibility before Tuesday, 21st of October 2014. If you are using an incompatible email client, you will need to upgrade – contact us for further information. Alternatively, you will be able to use Outlook Web Access in the interim until the necessary updates to email clients are performed. Once Hosted Exchange 2013 is made live, we will need to upgrade customers’ subscriptions to the new platform so you can take advantage of the 50GB mailbox size and other features available on 2013. You will not have the option to upgrade your subscription yourselves. We will send you a separate email in the coming days confirming 2013 has been made live. Any existing subscriptions will remain on Hosted Exchange 2010 until we initiate the upgrade. Eventually all subscriptions will need to be upgraded to the new platform. We will proactively upgrade any subscriptions that haven't been upgraded 3 months after the release of Hosted Exchange 2013. We will send a reminder when this date is nearing. Any additional mailboxes ordered for an existing subscription will be provisioned on 2010 unless we have performed the upgrade. Once live, all new Hosted Exchange subscriptions will be provisioned on the Hosted Exchange 2013 platform. We will advise you prior to initiating an upgrade on your subscription. No configuration changes are required on your part (DNS, email client settings, etc). Also, the link you use for Outlook Web Access (OWA) will not change. The pricing we have set on your Hosted Exchange 2010 plans will carry over to the new subscriptions. All customers, including those not yet upgraded to Exchange 2013 will see the new OWA 2013 splash screen when logging into OWA. Please be aware that not all email clients will be compatible after the upgrade on Tuesday, 21st of October. 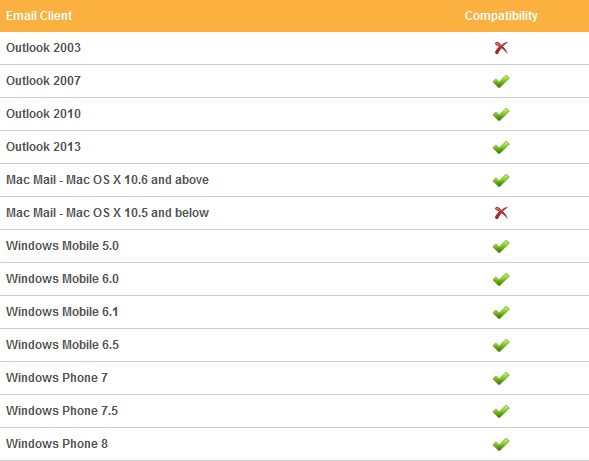 To ensure there is no disruption email services please check the compatibility chart below and upgrade if necessary. We have identified a number of clients using Outlook 2003. Please be aware that this version of Outlook is End of Life and is no longer being supported by Microsoft. This version of Outlook will not be compatible after Tuesday, 21st of October 2014. As always, we remain committed to offering you the best range of products with the highest quality customer support. We hope that we can continue to partner with you online and keep delivering the great service and value which you currently enjoy. Should you have any questions or concerns, please feel free to reach out to our support department by emailing: support@ma.com.au.